The birds-of-paradise are members of the family Paradisaeidae of the order Passeriformes. The majority of species in this family are found on the island of New Guinea and its satellites, with a few species occurring in the Moluccas of Indonesia and eastern Australia. 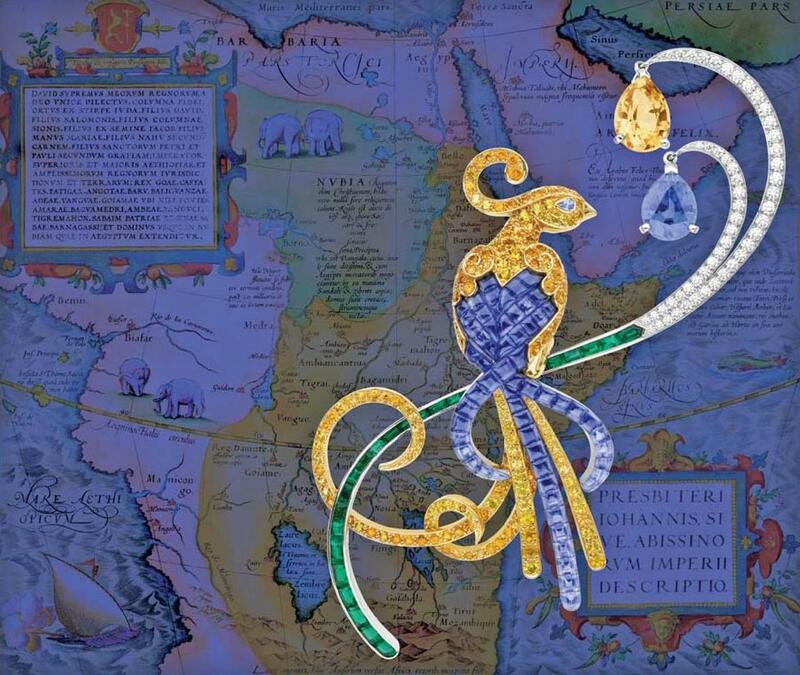 A bird layered in sapphires, paved with yellow sapphires and mandarin garnets, posing on a branch in white gold with calibrated emeralds in channel setting. In a pendant, a 3.21 carat pear cut sapphire, originating from Madagascar and an orange coloured 4.74 carat pear cut sapphire originating from Ceylon. Like a mid-summer night's dream, the heavenly rainbow of colors has enchanted the precious stones to be the loveliest attire for ladies. This brooch is the fruit of the new Van Cleef & Arpels Collection, the "Birds of Paradise".